Neil Blatchly picked up two wickets for Bexhill against Chichester Priory Park on Saturday. Hamish Russell was ‘reasonably confident’ Bexhill Cricket Club’s first team would have achieved its first victory of the season had the rain not intervened on Saturday. Bexhill were 21-0 in reply to the 196-8 posted by visitors Chichester Priory Park when the Sussex Cricket League Division Two match at The Polegrove was abandoned. After a delayed start, the match was reduced to 43 overs per side. Both teams were keen to get started as quickly as possible so Bexhill headed out to field after winning the toss without even going through a warm-up. 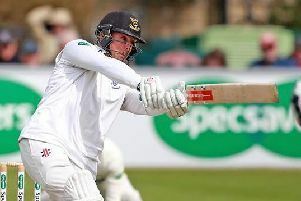 Although there was some rain early on, it gradually dried up and Chichester’s innings was completed without any interruptions. Chichester took some chances early on as they sought to take advantage of the fielding restrictions by going over the top. Shawn Johnson (6-0-29-2) made an early breakthrough with the score 14 and Byron Smith (9-0-43-1) had Peter Lamb caught by Neil Blatchly for 33 to leave Chichester 56-2 before Matthew Bennison (31) and Joe De La Fuente (61) added 82 for the third wicket. Blatchly (9-1-29-2) caught De La Fuente off his own bowling to break the partnership and Bexhill did pretty well thereafter, with Jay Hartard (30) the only other Chichester batsman to reach double figures. Nick Peters was the other wicket-taker with 2-51 off nine. It started raining lightly during tea, and although the players returned to the field, just eight overs were possible before the rain got too heavy and play was halted. Peters (7 not out) and Danul Dassanayake (9 not out) started pretty competently and didn’t look in any trouble. Both played a couple of decent shots against a Chichester side which changed both its opening bowlers after three overs each. “I would’ve backed us to get those (runs), especially with the wet ball and fielding restrictions,” added Russell. “But I suppose we did well to get as much cricket in as we did.